I made this for our green vegetable for thanksgiving. I liked it alot. Jiri not so much, he said he doesn’t go looking for green vegetables in Czechia either. It tasted better the second day I thought after the flavors mixed a little more in the fridge. With the garlic it is spinach for grownups. I added some sausage from the dressing and that made it great, at least for those of us who eat green things. i made it today and I will make it again! Uz jsem zapomnela jak dobry spenat muze byt! Can you use this sauce on pasta too? And what about dairy free option? You can definitely try to experiment. 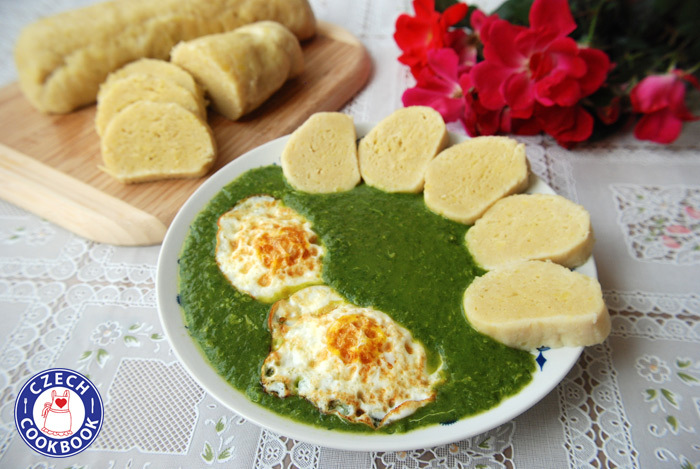 😉 We usually eat spinach sauce with potato dumplings, potatoes or gnocchi. You can try it with pasta and see how you like it. You can skip the dairy. My mom always cooks it dairy free. This turned out great! I did use frozen spinach because that’s what my Mom used to use. My guys really liked this spinach dish! I couldn’t quite get my potato dumplings right but will try again. This was my first attempt making the dumplings. I think I didn’t use enough Wonder flour. I took it out of the water after 35 min and it was still raw looking. I then boiled it for another 30 minutes and it was not quite right. It tasted great just not pretty! I am sure next time they will be much better. Keep trying! This dish was AMAZING! My husband and I both love it! Thank you so much for sharing. I have changed a few steps along the way that make it (we think) little bit tastier. First, I add 4 small garlic cloves to the blender with the spinach and water. Second, I add the salt and bring the chopped spinach and garlic up to a hard simmer, not quite a boil …. and then I shut off the flame, cover the pan and let it stand for a hour or two. This step allows the spinach and garlic to mingle and marry … never to divorce! Finishing up I add 3 whole garlic cloves to the oil on med heat … allow them to get nice and toasty, squash them and remove them prior to flour addition. That’s it .. this is a extra step that you need not do but, if you have the time, it will add wonderful extra flavor. Thank you so much for your video and your wonderful recipes!